You cannot make a man by standing a sheep on its hind-legs. Restless like the wind, the mourning dove shifts under the setting sun's final gasping moments. She eases through trees and mud alike, remembering fondly the squelching of mud underfoot as a mere girl, the horrified gasps as she'd trail it through temple rooms until set at the dinner table only to be banned until not a speckle from her feet could be seen. How many nights had her Priestesses made her go hungry, watched with condescending faces while she withered away ,while she learned and flourished under their tutelage? The smile that now curls pale lips is nothing short of serene and unearthly, as unsettling as the marsh wren chirping. Only echoing silence greets them, a roaring abyss that swallows all sound and lets none live too long. But this is her home. Juniper has learned the sinkholes that once were, her wings spread to lift her above foliage and wetlands that would otherwise be impossible to cross by foot. The breeze whispers to her, tickles her with a warm welcome, pulls the sweat from her skin as she delves deeper and deeper into the heart of the Tinea. Just ahead a reptile slithers back into the waters, beady eyes watching as she floats above. Pale as death, pale as a phantom, she merely winks and watches it fully submerge, watches as its water-trail disappears in search of distant prey. Vines fall from ancient trees whose branches don't even listen to the howling of those high currents far above, water splashes, reaching up, up, up to sully her pristine coat, to cover her cloak, but it isn't quite high enough. She pulls higher, just under the canopy that is as aware of her as she is of it; every beat of her wings draws autumnal leaves closer, sweltering sweat-drops from the sky falling to mist her coat once more. The fall never was as harsh as the winters. So she lands then, settles in alongside the broad expanse of a small clearing hidden away, a pool of water gurgling on the other side. Sinafay adored coming to this part, this one place of peace that rocked them to sleep in the summer heat after they'd indulged on fat, succulent berries falling heavily from their branches. It is here where she settles, a petite expanse of sky settling into the tall grasses, humming and crooning to the buzzing of crickets and dragonflies alike. He had never been to Terrastella. Raum had never needed to, except, maybe, when he watched the then Dusk queen and her brother. They had been involved in relationships with Night members and neither proved to be a strong or worthy coupling. Yet now the Crow comes, no longer as Denocte’s Ghost, but a Ghost nonetheless. Slowly he weaves through the underbrush of the Dusk Court’s lands. With each step his skin changes, dark to match his mood, bright to echo the sun or mottled to seamlessly fade into his surroundings. Solterra’s dust still clings to him, but its heat is now just a phantom’s touch. It no longer burns him, no longer turns his skin slick with sweat. Here the air is cool, here the air is clearer and even the dank of the swamp is not enough to make his skin crawl. Ah, Solterra was changing him again and how the idea makes him wish to flay his skin and raze the sun court to the ground! His teeth are pressed tight together, his nostrils flaring to drink the air - the air that hums with vibrant life and insects flying over stagnant waters. Raum wanders beneath vines and over fallen, damp, decaying trunks. He moves until a shadow passes over him and then he falls as still as a panther. Tinea swallows him, as if it knows a spy, as if it welcomes him. The swamp was made to hide the Ilati, it knows how to reach with its shadows and consume travellers into nothingness. Raum watches the snow girl land, he studies the curve of her horns that reach up and back. His eyes slide down the long khol lines that frame her face, the only part of her that night can touch. When will he think of anything but night? The Ghost needs to be someone different then, and his skin changes from silver to the richest chestnut, his eyes to the deepest green. No longer does he cut the air with his silver-blade skin and drown all he sees with his blue eyes. Instead, he is the verdant green of the forest, the deepest brown of fertile soil. Slowly he steps from the underbrush and out into the clearing in which she stands. Light shafts between them and he steps through it nothing like the traitorous king he is. Sunlight bathes him bright, bright, bright as if it wants Juniper to know just who moves before her. Water bubbles as an alligator slides into the nearby pool and the swamp begins to laugh. “Hello.” Raum utters, his voice as soft, as potently quiet, as deepest, darkest night. There is only the chink of his dagger against its brace and the rustle of bushes, as Legion settles down to listen, breaking the silence that hangs between them. Oh how Tinea holds her breath and welcomes a monster into its midst. e is the morning and the evening sun, he is the crocodile who opens and closes her eyes so quickly (so quietly) that only the branches have time to see, he is brilliant and bold and red as the glare of light dances upon his bloodied skin. Beside him, Raum's dagger glints and winks at her, as though they are cohorts and conspirators making secrets of lives they should not. She has not seen a man such as this, has not talked to one so whole in their masculinity and so comfortable in their skin. The Priestesses take women into their fold and few strangers make it far enough into the swamp to reach their hidden temple. This red demon is a new beast altogether, but she does nor rise from her bed of clover and dreams. Her laughing eyes hold secrets that dance and coyly smile as the darkness of his voice vibrates against her bones. It is a rush, a thrill, a trilling of her heart that should shy away as the swamp does. Oh, but he is something new, something unseen, something she wants to trace every curve and line of until it's as known to her as her own skin, as her own gild of women. Silver and green eyes that swirl as smoke meet those of forests and jungles and an untamable beast. Now is the moment when a chill snakes down her spine. There is nothing soft to that gaze. It is as hard as the creature that writhes beside him, eyeing her as though she is its next meal. Incented, nostrils flare and she disregards its presence completely. "You're something new," she answers pertly, stubborn jaw jutting forward as wings ruffle, raise, and resettle upon her bodice. A charming lilt to her words that only those from the deep swamps have hints at her origins here, a raised brow beckons him forth because she has no intention of standing yet. The Tinea knows a monster when it sees one, but all Juniper sees is a new work of art, a new sin in the sun at last. @Raum | "speaks" | notes: this is short, but hopefully acceptable ! The girl lies upon her bed of green. Ivy is her pillow, moss her bed and the filtering sun the sheets that cover her in gold. Her silver eyes are as bright as his true skin. He looks at them and thinks of mercury – the way they glitter, the way they shine and reflect the world back upon their beholder. Yet there is no poison there. Oh to taste mercury is to die, yet this girl is anything but. Dear Terrastella, the court with a dreamer king, a blissful world of dreamers and peace. Raum steps forward, he does not stand back. Through each beam of light he moves and how the sun transforms him into flames that lick and greedily drink the air of the swamp. Her coy smiles are lost to him, the laughter of her gaze, those eyes that dance with silver silk, chattering and dancing. Yet he studies her, the curve of her wings, the soft of her feathers. All of her glitters gold where snow does not rest. All of her is bright and fierce and so utterly bright. Raum is the flames to melt the soft of her. He should be the blade to cut, cut, cut. Yet he stands warmer than he has ever been, caught by the setting sun. He is Icarus and the sun is falling to catch him. ‘You’re something new.’ Yes, Raum thinks, but does not say. His skin is hot and his eyes are emerald. That gaze is the deepest depths of an old, old forest. It is creeping woodland strung with vines and hiding all within its looming shadows. Ah his gaze is beautiful as all forests are, yet it whispers terrible things as it charms and lures with its siren beauty. Slowly, slowly, he steps toward her. He moves until he stands tall, haloed by the sun, made glorious in its deception. Ah, Raum is no angel, no matter his beauty, no matter the golden divinity of him here. Death stalks him and oh it watches him from behind a blue, blue scarf. Legion’s skull tilts still listening, hearing the thrum of a girl’s breath as she rests in a bed of flowers. “I could say the same of you.” Raum murmurs. Too lazy he is to change his voice and it is the silk of a silver king. It is the rough camber of a murderous dictator. But when spoken through lips of gold, well, then that voice is a thing entirely other – especially when received by ears that do not know him. “I am new,” Raum muses softly. “Can you tell me more about my new home?” He murmurs gently, limbs folding as he lowers into the grasses beside her. In silence he looks up, up to the umbrella of boughs, up beyond the veil of leaves and there, oh there the sun searches for him. It yearns to bathe his skin in silver, to urge Juniper to run! Run! To keep her lips sealed, to betray nothing of value to a listening Crow and his monster. Does anyone remember a boy from Denocte: an orphan who became a performer, a boy who adorned himself in silks and glitter and danced upon a string held high, a boy who charmed girls out of money and jewels. An orphan who when his show was ended each night, stripped himself of silks and jewels and took to the streets like a wraith, murdering for money and justice… That boy lies beside a girl this eve and as his eyes tip up to those trees, they change from a dictator king into a performer once more. Then as his gaze lowers and he watches Juniper, then does he smile, warm as sunrise, with those golden lips. He gives unto this girl of snow and gilded gold, a beautiful deception. Raum is, and was, and always will be a performer. e moves, red, red, red beneath the green canopies. atop the aching swamp floors that would devour him if only they could discern every sin staining his soul (if any were left). Oh, but he moves as a snake, a cobra sliding nearer. He plunges forth as Ares, as Mars, as Phobos as Laran. Ah! but he is no God she recognizes. Glory favors the bold, and how bold this man with flashing eyes and flashing skin is. Inch by inch he comes closer, and inch by inch those green, laughing eyes eat him up as she would any other of flesh and bone. Juniper wears no shame in her perusal, in her hunt; she grins that girly grin, flashes her own crocodile smile and lets him slide next to her. When Raum is not near enough, pale wings extend until they are a blanket sheltering him from the sweltering heat and flesh is almost pressed chastely against flesh. "These swamps were mine before they were ever yours, I can smell their absence on you." A simple statement, a musical medley of words mashed into some semblance of sense and reasoning. For he does not taste of cinnamon fern or water-weed or the water-lilies she so resembles. There is no tang to his skin as there are on her sisters', there is no water running hot and cold and violently through his veins. But there is a fire, a curiosity. 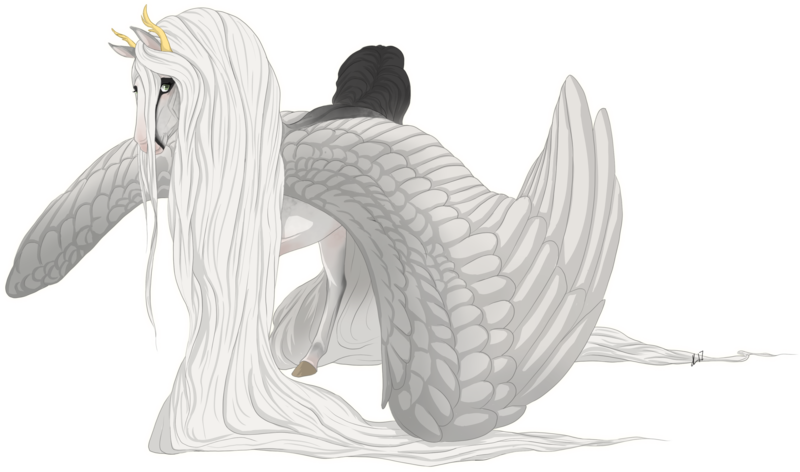 "No matter," the Pegasus whispers, voice like a lark, like honey in sunlight, like a goddess bursting into the world unknown. "An eye for an eye, a question for a question. Nothing is free, but you likely already know that," she winks. Audacious and crazy and brilliant, she ruffles her feathers over him and looks to the shafts of light that glitter so close. From beside them she plucks up an orchid, pink and marvelously vivid, and bit by bit it crumbles beneath her gaze, is shredded into strips so fine they become like thread. She repeats this, hibiscus her next victim, as she thinks of all she could say. "Our goddess teaches us the value of secrecy in these ancient groves, in the flicker of sunlight that holds a shadow - should I trust you to bear them as the Priestesses have done since our dawning?" Brows shoot up, a challenge to be met in the curve of her lips now pressed into a line. Grinning, she shreds another flesh-colored flower before them, a grave of what-was lying just ahead. There are so many marvelous choices, but what one will he choose, she wonders?